IP address is an address having information about how to reach a specific host, especially outside the LAN. An IP address is a 32 bit unique address having an address space of 232. Generally, there are two notations in which IP address is written, dotted decimal notation and hexadecimal notation. 1. The value of any segment (byte) is between 0 and 255 (both included). 2. There are no zeroes preceding the value in any segment (054 is wrong, 54 is correct). Each of these classes has a valid range of IP addresses. Classes D and E are reserved for multicast and experimental purposes respectively. The order of bits in the first octet determine the classes of IP address. The class of IP address is used to determine the bits used for network ID and host ID and the number of total networks and hosts possible in that particular class. Each ISP or network administrator assigns IP address to each device that is connected to its network. Note: IP addresses are globally managed by Internet Assigned Numbers Authority(IANA) and regional Internet registries(RIR). Note: While finding the total number of host IP addresses, 2 IP addresses are not counted and are therefore, decreased from the total count because the first IP address of any network is the network number and whereas the last IP address is reserved for broadcast IP. IP address belonging to class A are assigned to the networks that contain a large number of hosts. The network ID is 8 bits long. The host ID is 24 bits long. IP address belonging to class B are assigned to the networks that ranges from medium-sized to large-sized networks. The network ID is 16 bits long. The host ID is 16 bits long. IP addresses belonging to class B ranges from 128.0.x.x – 191.255.x.x. 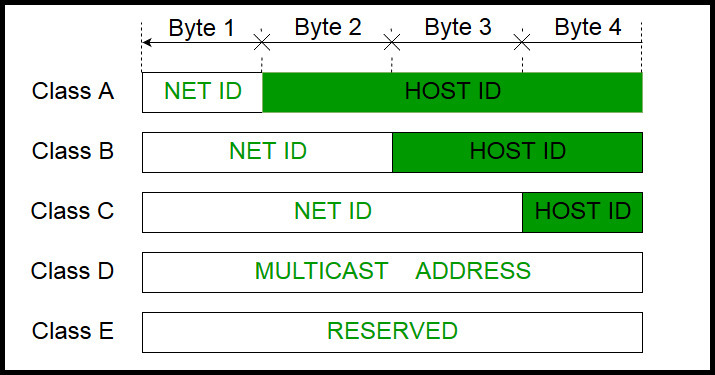 IP address belonging to class C are assigned to small-sized networks. The network ID is 24 bits long. The host ID is 8 bits long. IP addresses belonging to class C ranges from 192.0.0.x – 223.255.255.x. IP address belonging to class D are reserved for multi-casting. The higher order bits of the first octet of IP addresses belonging to class D are always set to 1110. The remaining bits are for the address that interested hosts recognize. Class D does not posses any sub-net mask. IP addresses belonging to class D ranges from 224.0.0.0 – 239.255.255.255. IP addresses belonging to class E are reserved for experimental and research purposes. IP addresses of class E ranges from 240.0.0.0 – 255.255.255.254. This class doesn’t have any sub-net mask. The higher order bits of first octet of class E are always set to 1111. 0.0.0.0 – 0.0.0.8 : used to communicate within the current network. Within any network, the host ID must be unique to that network. Host ID in which all bits are set to 0 cannot be assigned because this host ID is used to represent the network ID of the IP address. Host ID in which all bits are set to 1 cannot be assigned because this host ID is reserved as a broadcast address to send packets to all the hosts present on that particular network. The network ID cannot start with 127 because 127 belongs to class A address and is reserved for internal loop-back functions. All bits of network ID set to 1 are reserved for use as an IP broadcast address and therefore, cannot be used. All bits of network ID set to 0 are used to denote a specific host on the local network and are not routed and therefore, aren’t used. The problem with this classful addressing method is that millions of class A address are wasted, many of the class B address are wasted, whereas, number of addresses available in class C is so small that it cannot cater the needs of organizations. Class D addresses are used for multicast routing, and are therefore available as a single block only. Class E addresses are reserved. Since there are these problems, Classful networking was replaced by Classless Inter-Domain Routing (CIDR) in 1993. We will be discussing Classless addressing in next post. This article is contributed by Mayank Kumar and Gaurav Miglani. If you like GeeksforGeeks and would like to contribute, you can also write an article using contribute.geeksforgeeks.org or mail your article to contribute@geeksforgeeks.org. See your article appearing on the GeeksforGeeks main page and help other Geeks.